In the late-19th Century, the church at the corner of Brick Lane became a synagogue, as thousands of Jews moved into Spitalfields in the Huguenots’s wake. More than 2 million Jews left Eastern Europe between 1881 and 1914, prompted by economic hardship and increasingly ferocious persecution. Following the assassination of Tsar Alexander II in 1881, the persecution of Jews in Russia became even fiercer, and a wave of pogroms swept across Russia and neighbouring countries. Many Jews landing in England actually intended to go to America, but about 120,000 stayed in this country. Again attracted by the area’s reputation as a place for cheap living, and by the fact that it had been home to a Jewish population in previous centuries, large numbers settled in Spitalfields, often finding work in the ‘rag trade’. 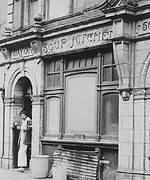 By 1900 Jews formed around 95% of the population in the Wentworth Street district of Spitalfields. This entry was posted in Anglo-Jewish Life and tagged East End, London. Bookmark the permalink.